Explanation: Microquasars, bizarre binary star systems generating high-energy radiation and blasting out jets of particles at nearly the speed of light, live in our Milky Way galaxy. The energetic microquasar systems seem to consist of a very compact object, either a neutron star or a black hole, formed in a supernova explosion but still co-orbiting with an otherwise normal star. 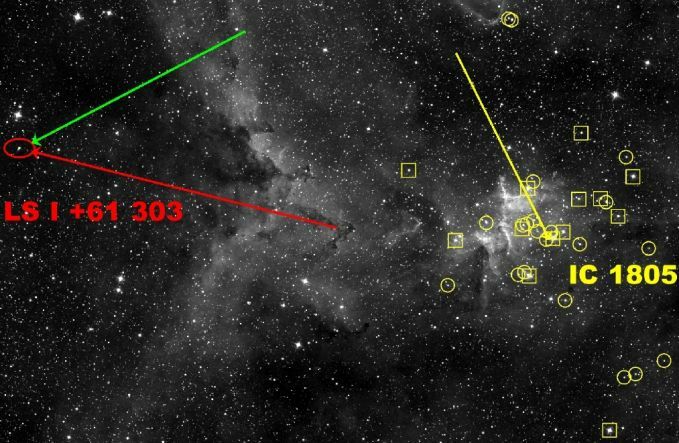 Using a very long array of radio telescopes, astronomers are reporting that at least one microquasar, LSI +61 303, can be traced back to its probable birthplace -- within a cluster of young stars in the constellation Cassiopeia. About 7,500 light-years from Earth, the star cluster and surrounding nebulosity, IC 1805, are shown in the deep sky image above. 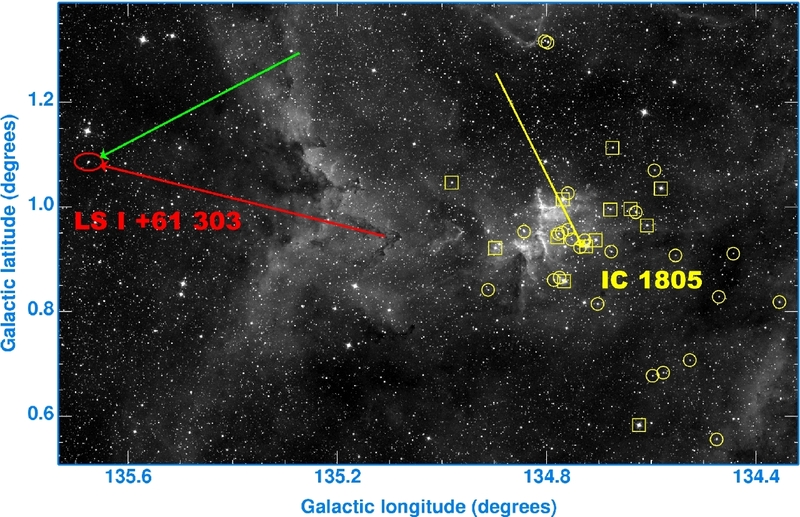 The cluster stars are identified by yellow boxes and circles. A yellow arrow indicates the common apparent motion of the cluster stars, the green arrow shows the deduced sky motion of the microquasar system, and the red arrow depicts the microquasar's motion relative to the star cluster itself. Seen nearly 130 light-years from the cluster it once called home, a powerful kick from the original supernova explosion likely set this microquasar in motion.